Mecaer America, a division of Mecaer Aviation Group, is located in Laval, Québec, Canada. Mecaer designs and manufactures hydraulic and mechanical systems and components for the aerospace market. Its products include flight controls, landing gears, actuators, dampers, valves, and power modules. The company designs, manufactures, and provides in-service support for the light- and medium-sized business jet and helicopter markets. Because some programs are considered “controlled goods,” or goods that have military or national security significance, Mecaer America is required to be International Traffic in Arms Regulations (ITAR) compliant. That means they need to know exactly who visits their facility and be able to review their visitor log at any time in case of an audit. 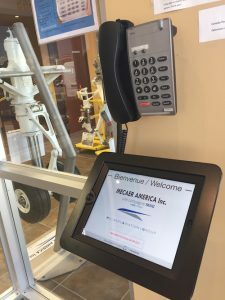 When Ronald Gauthier, Mecaer America’s Director of Supply Chain, and Chris O’Neill, the company’s President and COO, saw The Receptionist for iPad in action at CEF Industries, a Mecaer supplier, they decided it was time for an upgrade from the pen-and-paper sign-in sheet they had been using to track visitors. “The COO turned to me and said, ‘We gotta get this!’” Gauthier says. Before committing to a visitor management system, they researched a number of options. Ultimately they decided on The Receptionist for iPad because “it’s well-designed, it’s easy, and it’s friendly to use,” says Gauthier. “You don’t have to be a programmer. Even though we have an IT guy, I set up The Receptionist for iPad by myself.” Now, with The Receptionist for iPad, Mecaer America can document their visitors — including their citizenship status — and easily access their visitor log in the cloud at any time. They can even download the log as a PDF or Excel document. “We really like the reporting for if we’re audited for any reason,” says Gauthier. “It’s also helpful for statistics or if we need to email someone who didn’t leave a business card.” They’ve set up The Receptionist for iPad to send listed staff a text message and an email when visitors arrive. 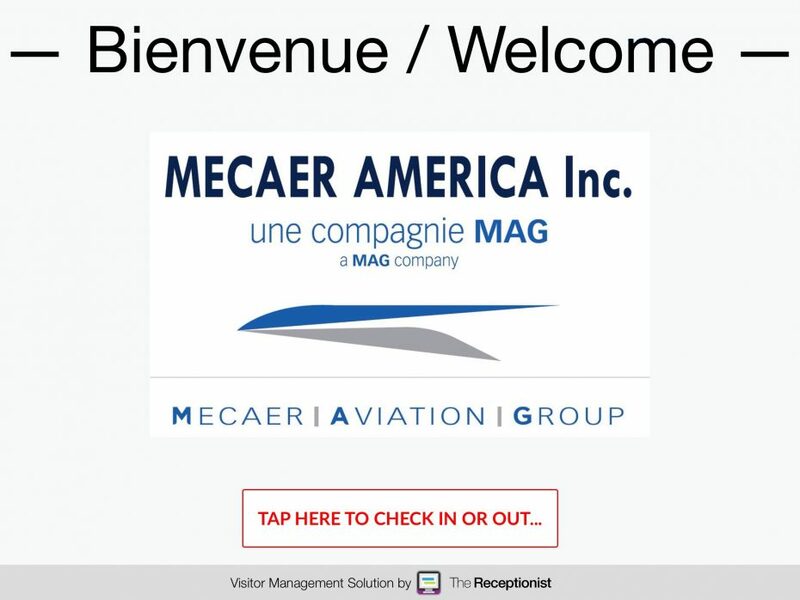 Since Mecaer America often receives groups of visitors, they installed a second Receptionist for iPad to speed up the check-in process. And so far, their visitors like it — especially the returning visitor feature that saves their information for faster check-in the next time. Gauthier also appreciates the Receptionist’s Radical Support team, which he says provides a customer experience that far exceeds the price of the software. “The Receptionist’s approach is fantastic and affordable software, but you get all the support that goes along with that kind of investment. Jessica’s been an absolute pearl.” We’re excited to welcome Mecaer America to The Receptionist family. To learn more about how The Receptionist for iPad can benefit your business, sign up for your free trial today! Mecaer America, as an integral part of the Mecaer Aviation Group (MAG) is a supplier of hydraulic and mechanical systems for the aerospace markets, including flight controls and landing gear systems. Based in Laval Quebec with sister companies in Italy, Mecaer America’s expertise is in the design, development, certification, manufacture, assembly, test, maintenance, repair and overhaul (MRO) of critical aerospace components including landing gear, mechanical and hydraulic flight controls systems, hydraulic subsystems and components.